Weekly Update 2018-10: Future funk music from Mexican artist Proux, evaluating your goat-based dowry, and the amazing street-based illustrations of Portuguese artist Bruno Lisboa. I have been feeling nostalgic for my SoundCloud days lately. Macross 82-99 just put out a new future funk EP, and I subsequently fell into a very good album radio on Spotify that has lots of delicious disco-flavoured dance music. One of which is a great artist from Tijuana named Proux. I couldn't find a ton of info about the artist, but the songs are all my favourite things about disco, pop and dance music. And they really get in your head, too. Favourite tracks include Just For Me and Grape Crush. It's finally biking season again! I've ditched my last Metropass for the season and managed to bike to and from work all five days last week. Note to self that it may not be worthwhile to buy a February Metropass next year since it's a short month and the snow has managed to stop about halfway through. Thanks, Global Warming! More noteworthy is the fact that I have acquired my #1 ISO (in search of) item on Bunz, basically since the beginning of my Bunz career two years ago. 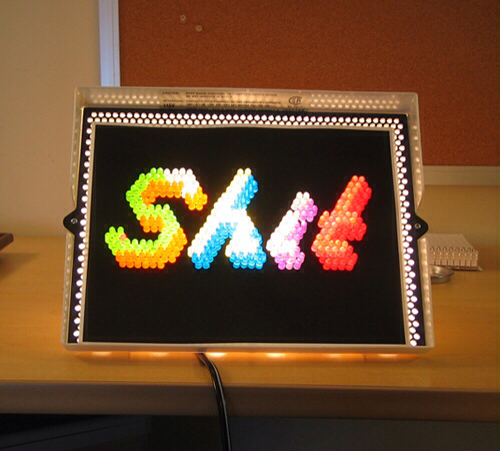 Yes, I have finally acquired a 1970s Lite Brite toy in perfect working condition. I feel like I should quit Bunz now, since there's nothing worthwhile left to trade for :) Just kidding. I also attended my first Sunday drumming class in a while since I graduated to the band - now I am back again to continue sharpening my band leading skills. One of the hardest parts of leading the main band is that they have all seen me come through the ranks and don't necessarily see me as a leader. It's a bit awkward that way for me as well, so being able to drop into the Sunday classes to lead this new cohort has been a much easier transition. Especially since the leader has to be borderline aggressive in ensuring everyone sees the signs and knows what they're doing, it's somewhat of a stretch for me. And onto my second week of consuming the super food that is chia seeds, I have learned a bit about them. chia seeds contain 15% protein and 38% fibre - keeps you nice and regular! I haven't gotten around to organizing my Facebook saved posts yet, but with all these awesome groups I have been joining, I have probably doubled my saved posts last week. So, the opposite of my original goal. Hoping to do this on Thursday night. One of the benefits of coming back to the Sunday drumming workshop is that I can hone some of the more technical drum pieces - like this fun solo I recorded Pato playing for our Reggae beat. I'd like to practice this to have it ready for this Sunday. I'm going to learn this on repique this week! Random Thought: How Many Goats? I often reflect on my luck of being born into the world I live in. Not only do I live in a prosperous first-world country with literally no real problems or needs, I somehow managed to scrape together a life with a creative job that pays me to do what I love. Many people in the world, women especially, do not get the same deal I was given. Consider the practice of a dowry, “property or money brought by a bride to her husband on their marriage” otherwise known as a sexist Bunz trade that suggests women are not worth as much as men and that the trade needs to be evened out with the ‘ttc token of yesteryear,’ goats. So, how many goats are you worth? If you want to find out how valuable you might be to a future husband (i.e. how many goats your father will have to give him in order for him to marry you), why not take this fun quiz and find out? I am worth nine goats, by the way...which I think is good? Bet you can't beat that. Portuguese illustrator and designer Bruno Lisboa has a really cool style. His work has a great grungy flavour to it, which flows easily from his street murals to his more formal design and printed illustration. Check out Lisboa's Tumblr, Instagram and Facebook page.